A candidate for Santa Clara County supervisor was censured Thursday by the local Democratic Central Committee over a sexual harassment claim filed against him in 2014 by an ex-staffer. Former San Jose Councilman Pierluigi Oliverio—who has denied the allegations that he verbally abused then-chief of staff Denelle Fedor—called the public rebuke politically motivated and a violation of the committee’s bylaws. Oliverio’s attorney, Ed Krause, told the packed room at the County Government Center on Thursday that, with less than a week’s notice, the central committee failed to give the candidate enough time to prepare for the proceeding. He also stressed the fact that Oliverio was dropped from the lawsuit. Bill James, who chairs the county Democratic Party, stood by the decision to bring up the resolution this week. In a letter sent to Oliverio and his attorney ahead of the meeting (available online here), he said the committee’s bylaws allow the party to express an opinion about a political candidate or elected official. The party has endorsed Oliverio opponents Susan Ellenberg, Dominic Caserta and Don Rocha in the race to replace Ken Yeager, who terms out of the county’s District 4 seat at the end of this year. It should be noted that Caserta also faces charges impropriety, as San Jose Inside reported earlier this week. Aimee Escobar, a DAWN board member and elected Dem central committee official, said the resolution on Thursday reflects the nonprofit’s mission to support women, to support men who support women and to demand accountability for those who don’t. Randi Kinman, another DAWN board member, said the resolution is about more than Oliverio—it’s about “the totality of the problem” of sexual harassment. Oliverio said the putative aim of the resolution belied its true purpose: to penalize him for his politics. The county supe candidate, who’s running against six other candidates, is endorsed by the Silicon Valley Organization—the regional chamber of commerce known as SVO—and did not seek an endorsement from the local Democratic Party. Oliverio said it’s only fair to mention that Kinman managed the campaign of Steve Kline, a union-backed council candidate who unsuccessfully challenged his re-election bid in 2012. Kline is now the campaign treasurer for Ellenberg. Julie Garza, another longtime Democrat, said she’s heartened to see her party finally taking steps to publicly address the issue. The allegations Fedor detailed in her lawsuit rang true, she said, because they reflect the experience of so many women. And today, local Dems joined union members at a press conference to echo Thursday’s resolution by denouncing Oliverio’s candidacy. To counter the narrative that Oliverio disrespects women, his campaign produced a YouTube video that features several female supporters vouching for his character. 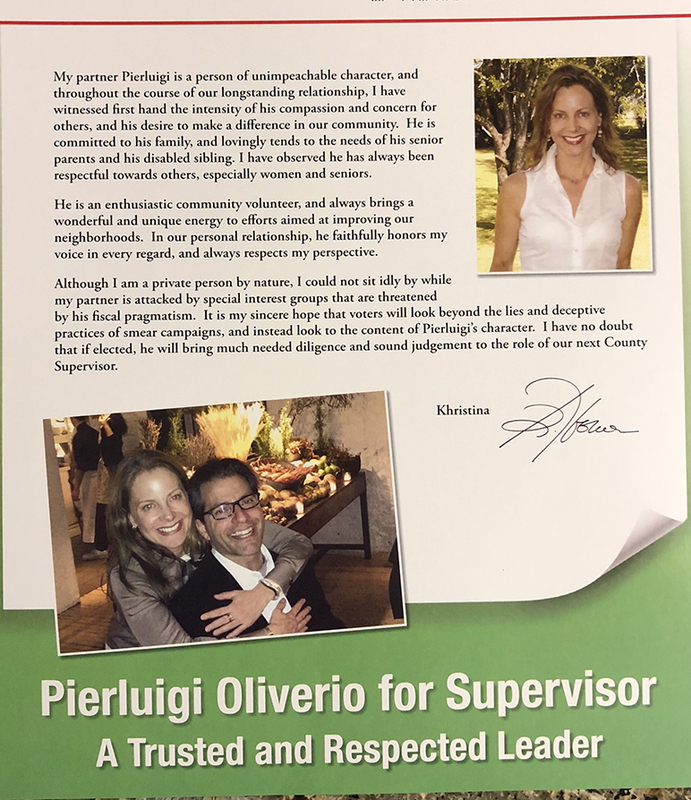 The video’s release coincided with a campaign mailer that includes a lengthy statement from Oliverio’s partner, Khristina, who says she has witnessed the “intensity of his compassion and concern for others” over the course of their longstanding relationship. “Although I am a private person by nature, I could not stand idly by while my partner is attacked by special interest groups that are threatened by his fiscal pragmatism,” her statement reads. When asked if he plans to sue the party for formally rebuking him, Oliverio indicated that the statute of limitations gives him two years to think about it. Below is a copy of the resolution. BE IT FURTHER RESOLVED, that the Santa Clara County Democratic Central Committee will educate voters, financial supporters, and others about Pierluigi Oliverio and his egregious actions and misconduct. Santa Clara County Democrats elected Bill James to serve as the next party chair, ending a 26-year run for Steve Preminger. California’s top Democratic Party official stepped down amid mounting political pressure over claims of sexual assault and harassment. I saw this pop up on my facebook feed. Can we say collusion here? Let’s start off with the basics. PLO got due process on this. No admission of guilt or innocence, and a very paltry out of court settlement. Now onto the collusion part. One of Rocha’s former staffers, Ann Grabowski was a director of DAWN. According to Grabowski’s ex, Rocha and Grabowski were very close. Rocha and PLO are running against each other. I don’t think it’s a very far stretch to say there’s some bit of collusion with DAWN/Rocha. As usual, I’ll give the disclaimer that not posting this will result in me posting this to facebook, and calling SJI out on it. I saw this comment on a computer monitor. Can we say confusion here? Let’s start off with the basics. Robert has been posting on SJI under his own name for a while now. Lots of documentary evidence to study his character and associations with locals. Robert ran against Don Rocha for City Council eight years ago. Robert was considered somewhat of a fringe candidate, and Don received the notable endorsement of Robert’s cousin, Dave Cortese. Robert alleges that Don referred to him as the black sheep of his family, and claims to have confronted Don about it when Don asked for his endorsement in the run-off. Robert has also written comments in the past expressing his dislike for Ann Grabowski, which he claims originated from a misunderstanding she had of a comment he wrote. I don’t think it’s a very far stretch to say that Robert has confused his personal animosity for Rocha and Grabowski with the possibility that Grabowski controls the entire DAWN board and pulls their string on behalf of Don Rocha (Despite the fact that DAWN endorsed Rocha’s opponent, Ellenberg). As usual, I’ll give the disclaimer that no animals were harmed in the writing of this comment. Robert Cortese- Not cool to accuse Don and Ann of something like this without any proof. Suit resolved in 2015 for just $10K. Plaintiff dropped Pier from suit. It’s one month before an important election. Rehashed by people that clearly have a grudge against Pier. These people are directly connected with his political opponents now and in the past. Chamber of Commerce changed their name (SVO – WTF?). Democratic Party will bend rules to tarnish anyone who doesn’t toe the line. It’s pretty transparent. Pure politics. And it diminishes the real issues of harassment. He may get my sympathy vote. I can’t stand PLO. He’s a complete and arrogant a&^hole who is not someone I would want to work with when it comes public policy. But the Santa Clara County Democratic Party has once again shown that it is not a credible organization. It’s a puppet of the South Bay Labor Council, namely Ben Field and Cindy Chavez. As long as labor controls the Party, there will never be any real dialogue and the quality of labor and Democratic candidates will always be subpar as labor would rather have incompetent and pliable candidates than independent thinkers who do what is best for the collective good. Labor doesn’t “control” the party, collective bargaining is a core plank of Democratic committees – local, regional, national – and has been for seventy five years. You conjure up images of iron-fisted hierarchies, when it reality being pro-labor is close to the most horizontal manner an organization can operate in and still participate in our political system. Just because GOP operatives have spent decades making unions unfashionable to working-class Americans doesn’t mean that kind of brainwashing has any merit to it. Just look at what the teachers achieved in West Virginia last month. True, Labor and Crony Capitalist control the party, at the determine to small business people, the middle class, and the working poor. I’m sorry, but you’re either wrong or not admitting the truth. What the South Bay Labor Council says goes. Steve Preminger was the party chair for nearly 3 decades. The party faithful is so afraid of labor that sycophants will do anything to win labor’s endorsement. Even if this means bankrupting cities through pension obligations, not advancing education reform, and not taking on the POA. We need real collective bargaining and we need to protect workers but look at the unions we have, their public sector unions with tons of protections, not private sector unions that need protection most of all. The policies of the South Bay labor council are short sided (think PLA’s, rent control, etc) that will not address core issues of inequality in the long term. This labor/chamber black-and-white ideology is a serious part of what is wrong with the local political climate. Some people believe in a narrative so strongly that they look for opportunities to repeat it everywhere, even in instances where it makes no sense. You are so deep in a bubble that you can’t see how unpersuasive that argument is. Ben Field and Cindy Chavez have done their fair share of dirty deeds, but they have nothing to do with this story. You whip out their names the way Republicans in Congress are constantly whipping out Obama and Hillary, like they’re boogeymen lurking in the shadows. You talk about labor supporting subpar candidates while defending Pierluigi for problems he is experiencing as a result of his sexual harassment suit. You don’t think someone you describe as arrogant, someone you would not want to work with, is a subpar candidate? What exactly about this story do you think damages the credibility of the Party? Are you questioning their moral authority to express their opinions about Pierluigi’s treatment of a woman, or are you questioning their institutional authority to conduct it on the timeline they’ve chosen? Jean I changed your statement a bit but your point was well made. But the Santa Clara County Democratic Party has once again shown that it is not a credible organization. It’s a puppet of the SILICON VALLEY COMMERCE (SVO), namely Chuck Reed, Sam Liccardo, Dev Davis, Pam Foley, Matt Mahood and Barry Swenson. As long as REAL ESTATE and CONSTRUCTION controls the Party, there will never be any real dialogue and the Democratic candidates will always be subpar as real estate and construction would rather have incompetent and pliable candidates than independent thinkers who do what is best for the collective good. > As long as REAL ESTATE and CONSTRUCTION controls the Party, . . .
Aren’t real estate moguls and developers greedy profit-seeking capitalists? And THEY control the Democrat Party? Does Bernie Sanders know this? I thought they were building affordable housing just because they had big hearts and cared about the poor. Pretty much all one needs to know about the South Bay Labor Council is that its leader, Ben Field, was suspended from the practice of law for unethical behavior on multiple occasions. If even the lawyers consider him sleazy, why would anyone vote for someone he and his group support? What does “he ‘verbally abused’ Denelle Fedor” mean? It is an accusation utterly devoid of specific content. What, he yelled at a subordinate and she wilted? It is impossible to judge the true nature of such a vague allegation without more information. The fact that gutless San Jose City Attorney recommended a payment of a mere $10k tells me that Ms. Fedor’s claim was weak. Doyle has recommended settling claims by gang bangers’ families for alleged excessive force that I would have taken to trial in a heartbeat. But even he saw how weak Ms. Fedor’s claim was. If harassment is claimed, the press should outline the specific acts alleged to be harassment, so that rational folks can decide the merits of the claims. JohnMichael O’Connor- I agree, but I think exposing the victim’s name in this article is BS. Did SJI have her permission to disclose her name? > I agree, but I think exposing the victim’s name in this article is BS. Did SJI have her permission to disclose her name? “The conduct in question is outlined in a lawsuit filed by a former female staffer of Oliverio in which she accused him of sexual and verbal harassment. . . . Presumably, the accuser’s name is on the lawsuit. If the accuser’s name is known to the court, and known to the Democrat Central Committee, there’s no reason that it can’t be known by SJI readers and by the public. No reason other than Democrats just like to suppress information. The Santa Clara County Government Attourneys (unionized) put out fliers a month or so ago outing the plaintiff in public for the first time. Quite surprising for lawyers to do this. > but I think exposing the victim’s name in this article is BS. Did SJI have her permission to disclose her name? Are you an immigrant from some third world satrapy? Or, a pathetic product of American public education malpractice? If a grown-up American citizen doesn’t know that one of the rights guaranteed in the American court system is the right to be protected from anonymous charges and to confront one’s accusers, then what’s the point of living in America? Knowing one’s accuser in an American court of law is a basic RIGHT. It’s a fundamental element of “due process”. If this is alarming to you, I think you would be happier elsewhere. Its a hit job..He doesn’t play along with the identity politcs and is not subservient to unions.. He looks out for the other 95% who dont benefit from these entities…Disgsuting act by a bunch of cowards.. It appears the dems are saying Pierlinguini is a closeted DINO? If so, he gets my vote. I never liked this guy, until these lemmings voted for this censure. Maybe edit in a donation link for whatever useless office this drone is running for, SJI? Dont care. Oliverio is a reptile. He is getting the same shaft he gave every Firefighter in San Jose. How does it feel….reptile? The Democratic Party is dead…This is a disgrace…Good Luck Santa Clara County…This guy Pier Luigi was the the most sensible and fiscally responsble person on the SJ city council and given the wateful spending of the County would be a godsend to make sure our taxes benefit all instead of playing this game of identity politics and Political Correctness.. Is concerning yourself with 95% of the residents such a bad thing.. Wait, DAWN claims that they are concerned about “’the totality of the problem’ of sexual harassment”, but they endorsed Dominic Caserta?? They did not endorse Caserta, they endorsed Susan Ellenberg. Not sure where you got that idea. Sorry–the paragraph about the party’s endorsement was right before the comment from a DAWN board member. I see that I misread it now. Will DAWN now bring a similar resolution against Caserta’s candidacy? And DAWN didn’t say “totality of the problem”. I did. Glad I could help clear up the other error for you. Can we assume that DAWN will now bring a similar resolution against Caserta’s candidacy? Not exactly an error–you are a DAWN board member being asked about the resolution DAWN submitted. Nothing in the article indicated you were speaking for yourself and NOT as a DAWN board member. But, sure, attack that question but don’t answer the question of whether or not DAWN will bring forward a similar resolution against Caserta, a candidate DAWN has previously endorsed. And DAWN did endorse Caserta in 2014. Whatever happened to innocent until proven guilty? The timing of this is suspect, too. We are looking like a third world country. Pierluigi has to be so happy that Caserta captured the crown from him of “most misogynistic candidate” in the Supervisor’s race.